If you visited northern Church Street this weekend, you may have been seeing red. 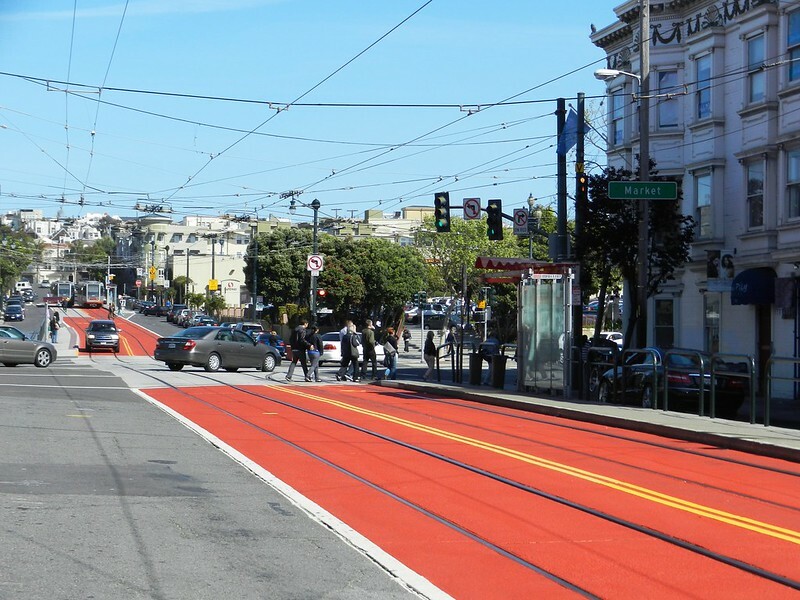 The SF Municipal Transportation Agency installed red-colored transit-only lanes on Church between Duboce Avenue and 16th Street in a pilot project to test how well the treatment keeps the lanes clear of private cars. 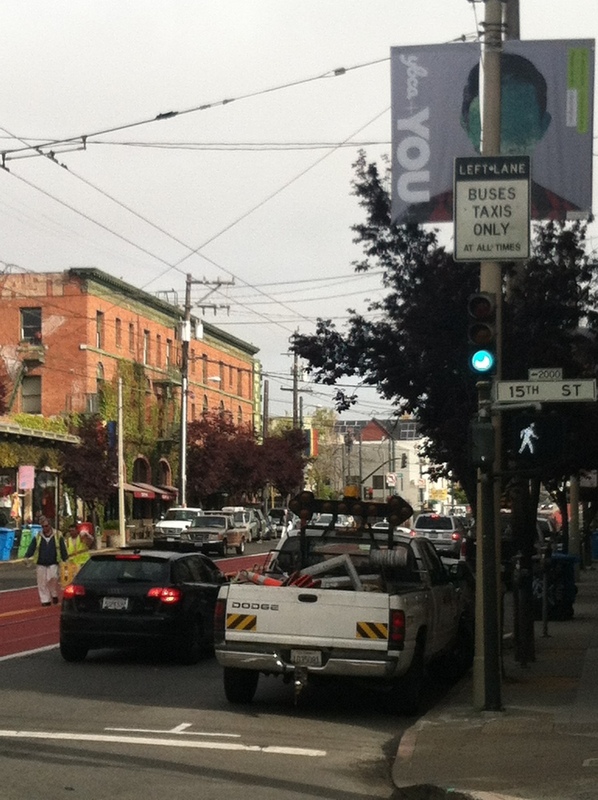 SFMTA spokesperson Kristen Holland said signs and pavement markings are also being added over the next couple of days. These are San Francisco’s second colored transit lanes — the first are the light-rail lanes on Third Street. However, these are the first colored lanes where buses and taxis are expected to drive as well, and the agency is watching how quickly rubber tires will wear the paint off. Most importantly, this improvement will be a boon for riders on the J-Church and 22-Fillmore who for too long have been delayed by auto drivers blocking boarding islands and turning trains. 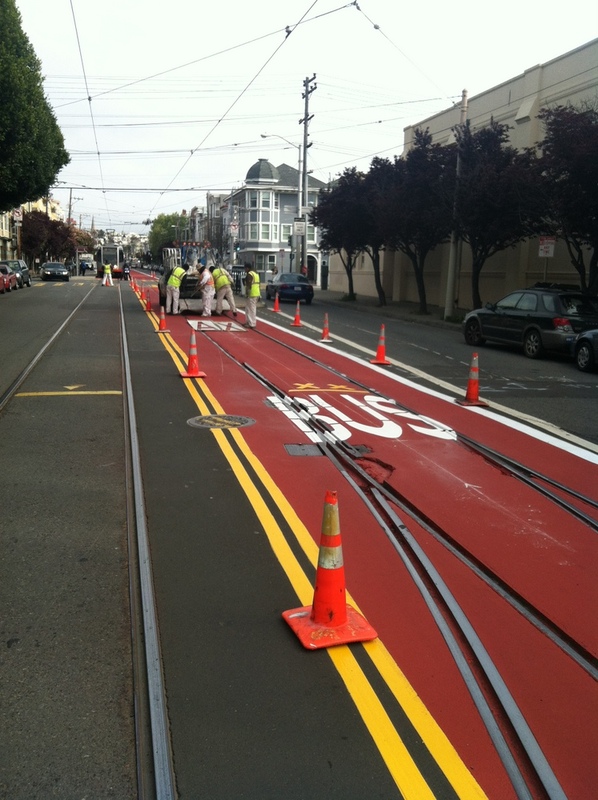 If the project is successful, Muni riders can expect more pavement treatments like these to be rolled out with the Transit Effectiveness Project in the coming years. First picture, driver in the red lane. Without strong-arm enforcement, these lanes will go the way of every other transit only lane in SF. as of 8:30 this morning, the red lanes were full of cars, not a sign or pavement stencil in sight. Hopefully those along with strong enforcement [ha!] will help. Yeah, sorry, we need a simple curb on the sides to prevent cars from ever entering the lanes in the first place, or pull a Europe and throw down greenery instead of pavement. Paint isn’t going to do it. Perhaps this should have been thought of when they JUST RE-DID THE RAILS? Glad to see the paint crews out this afternoon striping “BUS TAXI ONLY”. At a minimum, that’s going to be necessary to teach people what these red lanes are all about. Now SFians, please respect Muni and stay out of the lanes. My thoughts exactly – why didn’t they raise it up during the reconstruction? The more traffic, the more likely cars will be to disrespect this. After the Bay Bridge lighting ceremony, the bike lanes were packed with cars. Hopefully in the mild to medium traffic situations the red color, the signs and stencils will be sufficient. But in high-traffic situations there should be an enforcement component. Like others, I’m skeptical this project will achieve its intended goals because of the planned lack of enforcement against scofflaw SF motorists. Why would those who can currently–and with impunity–block buses, trains, crosswalks, sidewalks and bike lanes bother respecting some red paint on the road? Just look at the first photo in this article–a private motorist decided he’d pretend there’s no reason why he cannot drive in the restricted lane. Nice, but why didn’t they extend these lanes down to 18th St, thus giving the J a semi-exclusive ROW all the way to 22nd St? South of 16th the lanes could have included bumps to deter motor vehicles, as on the T-Third. As others have noted, what they really need is a raised curb to deter motorists from pulling into the lanes. As of noon the painting was half finished. The material is heavier than a normal coat of paint and required 24 hours to cure. It also takes a lot longer when you have to pick up and move everything when a train comes. Motorists manage to obey traffic signs and signals an overwhelming majority of the time, even when their aren’t as prominent and the road painted entirely red with bus and taxi only written the entire length. SFMTA also typically follows traffic changes with heavier enforcement. Putting in curbs would prevent 22-Fillmore busses from being able to change lanes if there is something blocking it. When the subway is shut down for an emergency or planned maintenance, the block just south of Market can be closed off and used to turn back trains. Likewise on the block between 15th and 16th, after the stencils were done but before the signs were up on that block, a couple cars were able to use the lane to get around a taxi that had stopped to let a passenger off. Raising it up would require changes to the trackway that would cost many millions of dollars for each block and it would be foolish to commit that much money without first conducting the trial to see what impact paint alone has. If paint alone is effective then move on to another pinch point. Both lines travel much further and have other problem spots besides the three blocks of the pilot project. It isn’t without context: construction hadn’t finished yet, 22-Fillmore busses were running in the side lanes still and the crews had to block the side lanes for a few minutes her and there while moving equipment around. Once finished though, it takes about three weeks for traffic to fully adjust to changes as people trying different alternative routes and it all calms down into a new normal. That photo isn’t without context: construction was still underway, no signs had been put up, 22-Fillmore busses were running in the side lanes still, and the crews had to block the side lanes for a few minutes her and there while moving equipment around. Context is indeed important. For months we heard scofflaw motorists insist they be held blameless for blocking the JFK bikeway. After all, how could they possibly comprehend a combination of red curbs, buffer paint, ‘no parking’ signs and ‘bike lane’ stencils? No doubt the same crowd will find it convenient to insist Church Street is also ‘too confusing’ for accountability. Red stop signs, red curbs, red lanes–golly, this must mean I should drive my car here! Context. Mark my words: without active enforcement, enough motorists shall continue to use those red transit-only lanes to jeopardize the project’s success. We don’t necessarily want to encourage SFMTA to study everything to death and withhold a good improvement from riders. Don’t let the perfect be the enemy of the good. Let’s give it a few weeks to let SFMTA make the necessary adjustments and see how it works then. There needs to be some way to more efficiently enact transit priority treatments in this city that doesn’t involve costly and time consuming projects. Zurich has extremely effective transit priority treatment: only taxis and trams are allowed to run in the transit lanes, there are no barriers, yet they work so well that the tram system is one of the world’s most punctual. The cheaper and faster something is to be implement, the more scalable it would be. And let’s face it, many more routes need transit-only lanes, so what’s needed is a scalable solution. One problem is that motorists tend to obey signs and signals they see often like STOP signs and traffic lights. Their precision goes down quickly from there. Sufficiently many motorists disrespect the Market transit only lanes, that they render them useless. So unless these treatments are commonplace statewide, SFMTA needs to be inventive either with heavier enforcement or with some innovative signage or other prevention techniques. Also, some of these signs should be put on the driver’s test and there should be some uniformity of design for transit-only and bike lanes statewide so that out-of-town drivers are not as clueless as they are now. Agreed, but congestion is highest between 16th and Duboce so it makes sense for a pilot. Let’s hope riders will clamor for more! Hard to tell, but Church necks down to one lane in each direction from 16th to 18th (the extra space goes to the wider sidewalk). This would require removing parking, therefore, which I’m all for, but would be much tougher politically than the current pilot. Next step! So what your saying is that the SFMTA should try to be innovative and try out new signage and other traffic control devices, just so long as they have already been implemented statewide? That’s a catch 22. Just because you have personally witnessed people driving in transit only lanes doesn’t render them useless at the scale of hundreds of thousands of travelers on or under Market everyday any more than the fact I’ve seen drivers run red lights and stop signs means they are completely useless and should be done away with. In the real world meanwhile, what often happens when something visual becomes common place is that it fades into the background and becomes white noise. Frequently the object hat jumps out at you is the one which breaks from the established pattern. Transport for London came up with the term “information wallpaper” for when there are so many signs the reader can’t tell what’s important anymore. There is a very good chance that drivers who’ve never seen a road paved red before will look at it, read the words BUS TAXI ONLY written the entire length of it and be able to put the two together. The goals of this project must be very modest, as there’s hardly any auto traffic on Church in the first place. So, the difference will probably not be quantifiable either way. I suspect this is a pilot test so they can judge driver reaction, paint quality, signage, etc on a more demure street before rolling out the red paint to Market, Geary, and other places where it would make a real difference in transit times. I don’t disagree and love the idea of the SFMTA spending less time on studies, more time on trials. I feel like the MTA should be quicker to implement extremely low-cost items: e.g., put up some barricades and block all car traffic on Church from Market to Duboce and Duboce from Church to Noe for a week or two. Monitor the impacts on car traffic and train traffic entering/exiting the tunnel. If it benefits trains more than it hurts cars, that’s transit first, make it permanent. Red paint is still costlier and slower to implement than other simpler options, and I personally feel that this trials does not go far enough to prove much of anything. Enforcement is the expensive, non-solving way to approach what’s simply a design problem. Design it correctly, and you don’t have to worry about enforcement. Design it poorly, and you do. Ticketing hasn’t solved speeding or parking issues since the dawn of cars. No amount of naval gazing can collect the amount of information as a real world trial. It also changes the dialog from stopping any and all changes at all to how are these changes working for you good and bad? And without taking a step back, how can we address it? A few years ago the SFMTA installed a trial pair of forced right turns for car traffic on Market Street. Cyclists were going to get killed and traffic would grind to a halt throughout SOMA from all the traffic. You probably wouldn’t need to stand there for more than 5 minutes (if that) to see a traffic violation, but enough cars do obey the traffic signs that that Muni service sped up 5%b and by diverting cars earlier, and at multiple locations, it dispersed the traffic throughout SOMA. It wasn’t perfect and one of the turns was relocated a few blocks and signage was quickly put up to help drivers find the garages/, but those were lessons learned and the traffic data helps inform the Better Market Street project. I was part of a stakeholder group that had some skeptics before the trial but after six months, hard data, and first hand merchant experience that it didn’t hurt business the group unanimously supported making them permanent. You are in luck then, this pilot is just a piece of a much bigger framework of policies, projects, and practices that were developed during the Transit Effectiveness Project. Because the overarching frameworks like the TEP and the Bike Plan are being taken through the environment impact assessment process it becomes a lot easier to roll out each of the individual pieces. There are toolkits of treatments (design patterns) for different situations and the guide for what to use when and where will get better as each new project informs what does and doesn’t work. Nothing being done here n Church Street hasn’t already been tried – successfully – in cities all over the world and here in the US. Yes. It’s great to see that MTA is trial-testing and piloting good ideas to improve the streetscape. Sometimes there are ideas that sound good on paper but don’t work at all in the real word. (Wiggle traffic circles, for example.) But I am glad they are testing, even though my own ‘red paint’ is on the line, because it isn’t known until you can see the results. Someone else mentioned state-wide engineering standards. Everything in the state manual has been tested to some degree and validated. So before any change can be made, some city has to try it somewhere. If red-painted transit lanes really works, it will find its way into the state and national standards, and then into driver education and so on. I did not draw a connection between statewide standards and experimentation. A state-wide standard on designating transit-only lanes, and a proliferation of transit-only lanes would have helped make drivers aware of them. But in the absence of those, Muni needs to be innovative. To this day, I see cars stopped for minutes at 30th and Church, waiting for the X red light to turn green. I am aware of the TEP. What you are saying is nice but it is just theory. I am afraid it would require a cultural shift and decades of persistence for it to reach Zurich’s level. My hope is that there is some way to expedite this, and with the TEP stalled for 5 years, it’s not exactly expediting anything. At this point, I don’t think red paint really means anything to drivers. And it’s hard to get drivers’ attention with yet another sign, either on a pole or painted on the ground. Especially if there are no consequences to driving down Church as usual. Heck, it’s hard to get drivers’ attention with a red light. Consider how hard it was to get cars to stop at the left turn from Fell onto Masonic. It wasn’t until the camera started handing tickets out that behavior truly began to change. There will have to be at least an initial period of enforcement (via police or cameras) in order for drivers to begin to equate red paint with something that might cost them money. We need to expedite the expediting. Have the LRVs gotten traffic-enforcement cameras yet? That would be a simple and effective mechanism. Before, during, and after the Bay Bridge lighting ceremony the floating bikelane/parking and at least 2 regular traffic lanes were packed with cars and the remaining inner lane was often packed with cars. I’m not sure if they have the cams yet or not, but even if they do I believe (pls correct me if I’m wrong) they’re only allowed to ticket parked motorist. Drivers in the transit lanes are a “moving violation” so it’s outside of SFMTAs authority to ticket them. Yes, SFMTA can enforce parking infractions but SFPD needed for moving violations. Good luck sitting around hoping someone will come along with another solution that can be completed in less than five years. So apparently the project is complete (according to the MTA’s repeated tweets) but there’s not a single stencil from Market to Division. What gives? A variation of their “experiment”?